Few questions are as complex and near impossible to answer as, ‘Who am I?’ In today’s world our identities are akin to a kaleidoscope; changing appearance with each move we make. Unlike the generations who have gone before us, we do not cement who we are by our job, political affiliation or domestic relationship. Our modern identity is constantly evolving, allowing us to move from job to job, nationality to nationality, culture to culture, relationship to relationship and from left wing to right-wing and back again. Intrigued with the idea that art can inform and influence identity and expand knowledge of politics and culture is Canadian artist and lecturer, Will Kwan. Born in Hong Kong and raised by “working class Chinese immigrant parents” in Canada, Kwan first took an interest in art during his college education. 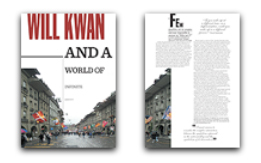 “I attended an art program that encouraged students to take academic courses in other disciplines such as philosophy, comparative literature and political science,” says Kwan. “My studio courses became hands-on laboratories where I could use moving images, performance and pictures to interpret theories about image production, politics, identity and culture.